Discussion in 'Off-Topic Discussion' started by sparkyscott21, Mar 24, 2014. 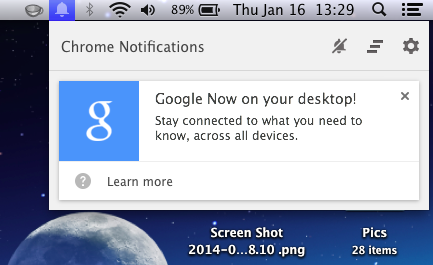 Starting today and rolling out over the next few weeks, Google Now notifications will be available to Chrome users on their desktop or laptop computers. To enable this feature, simply sign in to Chrome with the same Google Account youre using for Google Now on Android or iOS.